I woke up early (for me) this morning and so decided to listen to some music on my iPod. Sometimes when I’m in bed at night, trying to go off to sleep and find sleep elusive, I set myself tasks. A favourite one is to do an A-Z of David Bowie songs. I’ll think of a song title apt for the letter of the alphabet then play the track in my head. It eventually helps get me off to sleep. Better than counting sheep! So this morning when I got hold of my iPod I thought I’d actually listen to a Bowie A-Z. As you can see I got up to the letter “R”. I will finish listening to the rest tonight. File-Sharing, Not Such A New Phenomenon. I’m sorry if I am coming across as naive, but music file-sharing isn’t a phenomenon that has cropped up in the digital age. This post was spurred on by a conversation on Radio 5Live with Richard Bacon talking to Feargal Sharkey who is now, these days, head of UK Music, an umbrella organisation representing the collective interests of the UK’s commercial music industry (info, Wikipedia). They were talking about people sharing music files on the Internet. But while the conversation started I was thinking “this is NOT a recent phenomenon”. We have been file sharing for many years. Okay, it might not be on the scale it is now, due to the way the Internet has allowed people around the world to interact with each other, but it has been going on for a LONG time. I lived in an age where the vinyl record and radio ruled. Many people who bought an album preserved it by making a cassette. And if they had a friend who was into the same music, they’d make a copy for them. The top 40 would play on the radio on Sunday afternoon and if you had a cassette recorder and a blank tape handy, you’d record your favourite hits from the top 40 off the radio. Then the CD player and CDs came along. Copy the CD on cassette for your friend, then the PC came along, but the Internet was a bit too slow for mass file-sharing, so we exchanged CDs via mail swaps. And then finally high-speed Internet came along and we were not only able to share files, but buy MP3s from reputable music sites like iTunes. The law of balance has turned round. Music sold in its millions in the 1970s and into the 1980s. Songs like Do They Know Its Christmas sold millions. It wasn’t really shared by anyone. It would be utterly frowned upon to share it, it was a charity record after all. No one would have been seen DEAD trying to get a copy for nothing – still, if you were determined, you’d have taped it off the radio. I’m sure some people did. All the millions belong to “illegal” downloading now though. It’s turned from lots of music sold and not much music sharing going on (although it WAS happening back then), to millions sharing, and not much music selling. Boo hoo! The horse has bolted. People have a different and much lower value on music these days. The music industry just needs to be more innovative and come up with alternative ways to sell their product. The Cheslyn Close household is a gadget minefield at the moment. I’ve just taken possession of my first ever iPod yesterday. I am LOVING it. Don’t know WHY I ever went for the X-Fi in the first place, or persevered with it for SO long! Money, I suppose. It sort of dictated my decision. But I’m not the only one in the house who’s got a new toy to play with. Em has also got a gadget to play with. I only ordered it on Monday night and it arrived this morning! It was meant to delivered next week, but arrived this morning. No complaints here! As for me with the iPod. At arrived yesterday afternoon around 4.00pm and I did an “unveiling” with photos I uploaded onto Flickr. Em plugged it into the back of the Mac, it started charging. Shortly after Em started the iTunes syncing process and about an hour later 60GB’s worth of songs (some 8000 tracks) were loaded onto it. Amazing! The one thing I WILL say is that, in agreement with most people, I would highly recommend getting a good set on in-ear headphones for it, as the Apple phones ARE crud! I’m keeping my Creative phones that came with the X-Fi as they are KILLER phones! Other than that, I cannot fault it. It’s got a lovely, earthy, rich sound and it works like a dream. I Have Officially Bitten The Bullet! For a little while now I’ve had a niggling doubt about my X-Fi. Not to do with its performance, it’s a GREAT player, but for its ease of connectivity. See, I live in a Mac/Linux house. All forms of Microsoft and/or Windows are banned in this household (my choice, along with Em’s). When buying the X-Fi I knew I was taking a gamble with connectivity. When it connects to a PC (and when I say PC, I mean PERSONAL COMPUTER – PC does NOT equal WINDOWS based OS computers!) or laptop/netbook, the X-Fi wants to connect using Creative’s Centrale` software, which is Windows specific. Us non Windows based PC users have to use MTP software to try and have the X-Fi be seen by the non-native software. This hasn’t been the most successful undertaking. In the early days of owning my X-Fi, it seemed to work, but then I just ended up having endless connection problems (the software would see the X-Fi, but the X-Fi would crash, etc) and resorted to putting things on an SD card. Only problem with that is the SD card doesn’t integrate with the X-Fi, so the music on the SD card doesn’t get played in shuffle mode, for example. And you can’t load songs from the SD card on to the player! A real pig. I’ve sort of come to the end of my tether with this and have now decided to get an iPod Classic 120GB player. I’m able to get it on a “buy now, pay July 2010” offer. So I’ve gone for it. It arrives tomorrow and I’m a little excited. Reserved excitement – which is RARE for me! I tossed up SO much between the X-Fi and the iPod at the time I was initially looking to buy into a substantial MP3 player purchase. 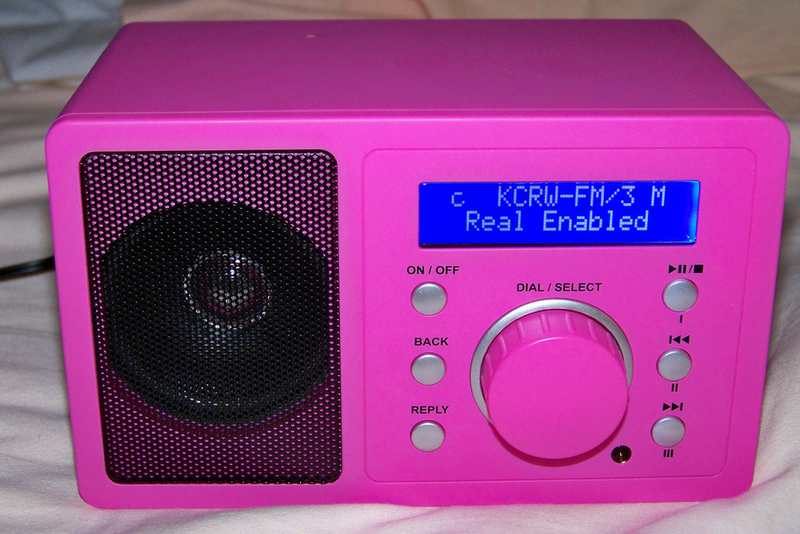 The price difference swayed me, backed with some negative feedback Apple gets for its prized player. I’ve gone for the Classic as it offers SSOO much space! One of the bonuses I thought appealed with the X-Fi was its expansion slot for SD cards. But non integration makes it a help AND a hindrance. I’m sure the 120GB space I’ll get with the iPod will take a LONG time to fill, and also the fact that I actually HAVE a Mac will make file transfers so much more straight forward (I am REALLY hoping!). So, I’ll let you know how I get on in days to come. I fell like SUCH a lemming for finally relenting and buying into the iPod phenomenon. As much as I love Apple products, many can be a bit too “style over substance”, but we’ll see. I hope I’ll be eating my words in the next 48 hours. Bird Calls & People Watching. We went into the town centre yesterday. Em had an electrolysis appointment and I wanted to get to the local Snappy Snaps photo store to get my passport photos done. I went to Snappy Snaps, approached the guy at the counter saying I wanted passport photos for my Oz passport done. He said “no probs”. He grabbed a folder to look up the specs of the photos. I said to him that I had the info he needed on photo spec with me. He looked at it and again said “Yep. No problem. I’ll just grab my camera.” It cost me £5.49 – only slightly more expensive than the photo booth, which was surprising! He took me through to a room in the back. I stood against a white wall and he fired away. Shot done! I was surprised how quick it was. Quicker than a photo booth actually!! He gave me a receipt and said my photos would be ready in about 20 minutes. Em went off to her appointment and I had some time to kill to wait for her return. From there I had a look around Evans (the big ladies clothes store). Went to the cheap rack, but there wasn’t really anything there. I just meandered for a bit. I went off back to Snappy Snaps to collect my photos. He showed me them. I looked like death! But they looked to be the right spec and all. He cut them to size for me and that was it, job done. I then went round to the post office to send my application off. The queue wasn’t too bad. But I go to the post office in town SO infrequently that I didn’t realise that when they renovated the shop, they took away most of the counter with the pens on chains FFS! The only “counter” with a pen-chain was the little lottery stand by the door. I had to stand at the lottery stand and work out all my passport stuff there. It was a NIGHTMARE. There are some counters inside the store, but there are no pen-chains on them! I was NOT going to buy a pen. And I didn’t have one with me. So there I was for 10 minutes, balancing everything on an oval writing surface the size of a small cooking dish, while I wrote my name on the back of one of the photos and wrote out the address on the envelope. Thankfully I was served quickly and the letter was on its way. I hope everything is in order with the paperwork. I don’t want it to be sent back ‘cos it’s wrong and I end up having to go into London anyway!! After that, I went back into the mall and went to the supermarket to stock up on UHT milk. I still had LOADS of time to kill so then went to the department store and had a couple of flavoured steamed milks. Then I just sat on a seat in the middle of the mall and people watched for over an hour! Gawd, it drove me crazy! I get really into it. Watching people’s faces. Looking at among the hoards if there is anyone I fancy, or looks good. It’s SO bad! When Em came around the corner to rejoin me I was in a reverie about how I’d feel when I finally saw her coming to rescue me from the people watch. There was only one other time I was SO relieved to see someone. I was at Liverpool RTA (Roads and Traffic Authority) getting a “proof of age” card (the RTA handle issuing driver’s licenses – akin to the DVLA in the UK). My then boyfriend Roger had dropped me off. He was meant to be picking me up 30 mins later. I can’t remember what happened. I think his car broke down or something. It was before the age of the mobile phone and I had ZERO money on me to call from a phone box. And I dare not walk off in case he arrived and couldn’t find me. I was there for TWO HOURS! When he finally showed up, I was SO relieved. The RTA is not in the centre of Liverpool. It’s a little way out of the CBD, so I couldn’t occupy my mind by looking around shops in a mall or anything. It was just on a highway. All I could do was watch cars fly by at 60mph. While I’m thinking all this, Em comes round the corner, sees me in my reverie and looks all forlorn and feels sorry for me. I wake from reverie to notice her notice me and I felt bad ‘cos I’d lost expressing the joy I knew I was going to feel once I’d seen her turn the corner! The moment was lost. But I’m sure my expression when Em saw me was priceless. 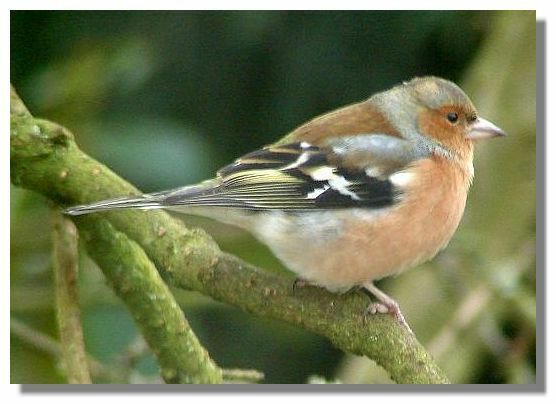 Before we left yesterday, we were being serenaded by a chaffinch outside. I tried to pinpoint where he was. I could see him, but I could definitely hear him! I found him, sitting at the top of the oak tree. I’d just reached for the binoculars to have a look when he up and left. I swear birds have a some kind of binocular sensor built in! I’d just literally got hold of them and was about to put them to my eyes when off he flew! Anyway, he’s been at it again today. Serenading us. I’ve been able to hear him alright, but visually he’s being even MORE elusive than yesterday! They are such a gorgeous bird to look at too. Wish I could see him as well as hear him. We got a sample of him singing on the camera. Caffinch call click to play. This isn’t “our” one. It’s just a pic of one so I could show you how pretty they are. I had this song come into my head the other day. It’s called “Bedroom Eyes” and was done by this Oz singer called Kate Ceberano. It was playing in my head, so I bought the song on Amazon. Then, all I could see when I listened to it was David Tennant’s lovely brown doe-eyes, so I thought I’d make a montage video of him and his lovely “bedroom eyes”. I’m SO gone on him – seriously!! I’ve just finally got to grips with making playlists on my Zen. I grasped the basic concept but found tweaking the playlists to my exact tastes a little harder to work out initially. But I’ve got it all worked out now. U2 Mix – most of all U2’s stuff on there. Boy, October, War, Unforgettable Fire, Joshua Tree, Rattle and Hum, Achtung Baby, Zooropa, Pop. I haven’t got ATYCLB or HTDAAB on yet though. Then there’ll be the new one to put on after Xmas – Yay! Bowie – Not EVERYTHING Bowie yet. Just a selection from Space Oddity, Hunky Dory, Ziggy, Aladdin, Pin-Ups, Diamond Dogs, Station To Station, Low, Lodger, Scary Monsters, Buddha, Outside, Heathen. Antipodean (ha) – Tracks from all Oz/Nz acts like Icehouse, Split Enz, Crowded House, Headless Chickens, Hunters and Collectors, The Cruel Sea, You Am I, Spy vs Spy. I’ve got two 80’s mixes lists. One is ALL the 80’s music I have on the player, and the other is a cut-down version of my absolute faves. When I’m playing tracks from the playlist I put the player on shuffle mode so all the tracks get mixed up.